Last week I got an email asking if I'd like to review the Mothercare Spin pram. Without a moments hesitation I agreed. I didn't know which colour we would get as there are a few different options but last night it finally arrived... the Mothercare Spin Black Jacquard (Limited Edition) and I am in love - already - it is so beautiful, I could cry. You're probably wondering why it's called the Spin? Well, it's because this pram has a 'one hand' spin mechanism to transfer the seat from forward to parent facing mode. It's so easy to do!. I took it out today for the first time and my trip only confirmed my undying love, I'm just praying that it won't let me down! I have such high hopes for it and can't wait to report back on it's performance. I'm already impressed by the rain cover. I have only used it in pram mode, but the great thing about it is there's a zip on it so if you need to get to baby you don't need to take the whole cover off the pram - you just simply 'unzip'. As well as the rain cover you also get a luxurious, soft, furry lined Cosytoe, a pram liner, and a furry lined pram apron. I wish I could get in it, it looks so snug. 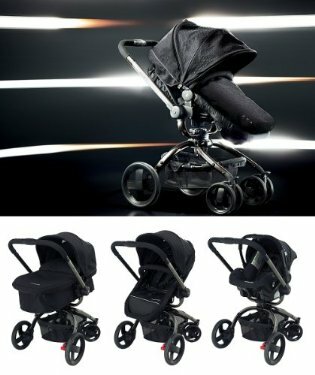 My only negative comment, is that it's not that compact when folded down, but as it's such a great looking pram I think I'm just going to leave it up in my living room as a centre piece and coo over it all day. Really looking forward to hearing how you get on with it, I plumped for a Micralite, which I love, but I do regret sometimes that I can't have my baby looking at me now she's in the stroller version of it, to have the option would have been great.